Holy Toffoli! Two goals in 23 seconds and the Kings shocked the Sharks at Staples Center on Thursday night to take a 2-0 series lead. As usual, Jonathan Quick was amazing, except I’m beginning to think the Kings players think they can go into a coma for long stretches because of his greatness. Speaking of coma’s, I thought Anze Kopitar was going to go into one when he got hit in the face with the puck in the 3rd period. After Kopitar left, the Kings were without 2 of their top 3 centers, and you could tell. The Sharks won 44 faceoffs to the Kings 21, and they outshot the Kings by a wide margin until the last few minutes of the 3rd period. I also take back half of those bad things I said about Jake Muzzin, who is playing some better defense. This game was phenomenal, but the finish wasn’t better than the Miracle on Manchester in 1982, or the Frenzy on Figueroa in 2000. Both of those comebacks had much greater deficits, and were at much more pivotal points in those playoff series than where we are now. The Sharks have had plenty of playoff disasters over the years, but that collapse has to be right up near the top. If these guys were a Canadian team, they might have their citizenships revoked by now. 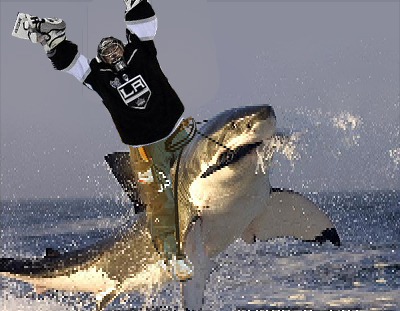 The Sharks are just as good as the Kings at home, so it’s hard to imagine LA sweeping this series. Still, the Kings need to put the Sharks away quickly so they can buy some time to get healthy before facing the Blackhawks. They’ll need the likes of Stoll and Matt Greene to win that series. This entry was posted in Kings on May 17, 2013 by omzzzzz.